Although fires are comforting and beautiful to look at night time. The scar a fire leaves behind during the day is much less attractive, with a mass of partially burnt timber, coals and a section of soil that will be dead for years. The burning of timber also destroys the habit of many insects and animals. Consider using stoves and candles instead, if a campfire is important part of your experience than consider careful the environment that you visit. Have water nearby in case someone burns themselves. 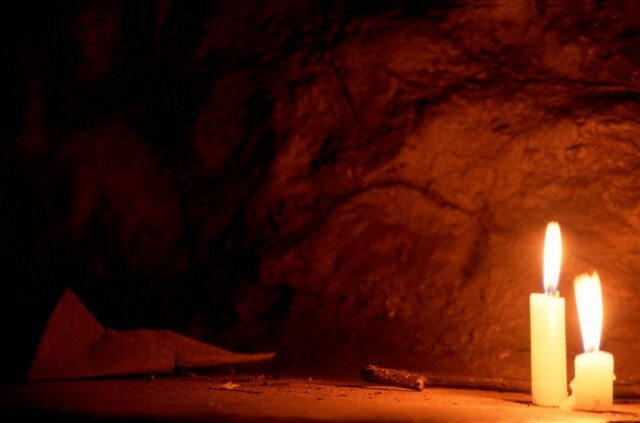 Carry alternatives such as non-drip candles. Fires create a lot of heat and burn timber. The heat denatures the organic material in soil and kills living organisms and seeds in the soil. The timber that is burnt is often home to insects or reptiles. The fire leaves a scar on the ground that can take decades to recover. 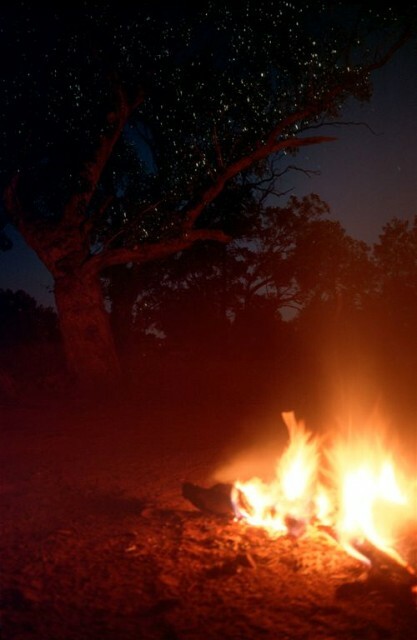 Sitting and chatting around a campfire is a great part of the outdoor experience so that is why there some alternatives have been suggested and if you do light a fire some guidelines to minimise the impact. The lowest impact option will to decide to not light a fire. Some areas are declared fuel stove only areas. In these areas campfires are always banned. This is usually because there supply of timber is scarce or that a fire will cause unacceptable significant damage. Never light a fire on peat type soil. Peat is combustible and is very difficult to extinguish. The fire may burn underground for many years destroying vast tracks of land. Fire bans are regulated by the states and are based around boundaries of local government areas. Some parks will carry there own specific fire ban status that is sometimes higher than that of the surround area. Fire bans are there to protect the area you are travelling though, and you should adhere to them strictly. Ignorance is no excuse if you are in the bush for days you may not be able to find out the official fire risk ratings, you will need to make a judgment call, but always sit of the cautious side. Fire bans are based on a number of factors including the forecast and the recent history of temperature, wind, rain, and humidity. Remember that most portable stoves can't be used in a total fire ban either. Using an existing scar reduces the area of damage. Since the majority of impact that is caused is from the fire itself then it is best to keep that damage to a specific area. It would appear that repeated use of the one spot limits the damage to the wider area. If there is a choice of fire scars then use the one on the most durable surface. Branches that have fallen recently that are not green, will burn best and be less likely to be home to insects and animals than branches that have started to rot. Ripping branches off trees is not permitted in national parks and leaves obvious scaring on the tree. About an hour before you go to bed or plan on leaving the fire stop putting new wood on the fire and just feed in timber that is partially burnt. These will mean that all the timber will burn up leaving just ashes and not big coals and partially burnt sticks. Ashes can then be scattered over a large area among the trees where the timber was collected (make sure that the ashes are cold). This will return some of the material to the soil from where it grew in the first place. As mentioned above it is best to let the fire burn out through starvation to ensure that it is fully burnt. Once this is done the coals and ashes can still be hot enough to ignite again. Therefore always cool the fire with lots of water and stir the ashes until it is cold. 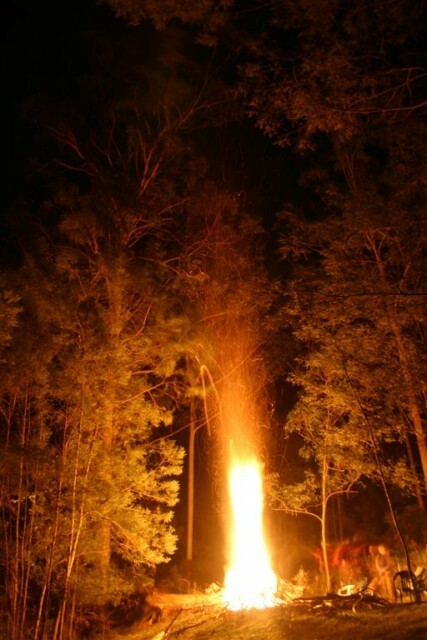 Every year bushfires are started by well meaning campers, do not be one of them. Such bushfires causes enormous damage to the bush.